Sustainable environmental initiatives pave the way for a coveted California coastal-zoned expansion permit. There is no shortage of potential roadblocks when it comes to permitting. Even the best and the brightest have fallen short in this pursuit. But for one coastal-zoned quarry, a long permitting process resulted in sweet, unopposed success – something to be savored by Richard DeAtley, president of West Coast Aggregates, which describes itself as “an environmentally concerned company.” In partnership with his savvy consultant, DeAtley employed several winning strategies, each just as important as the other. For West Coast Aggregates, a long permitting process resulted in sweet, unopposed success. Their meticulous game plan included highly creative environmental impact mitigation; the enlistment of key-decision-maker support via open information sharing; and an ongoing education campaign on the value of maintaining a local source of aggregate products. 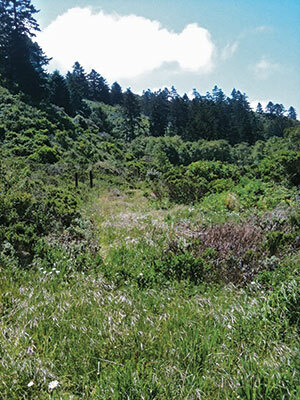 With those initiatives in play, the eventual jackpot was the permitting of reserves exceeding 52 million tons at the Pilarcitos Quarry, which is located near the California coastal city of Half Moon Bay. Operating five locations, West Coast Aggregates processes a variety of drain rock products and concrete aggregates. Its Pilarcitos Quarry is the largest granite extraction site on the peninsula with a capacity of more than 600,000 tons per year and products that include fill sand, road base, concrete sand, slurry seal material and gold track fines for landscaping applications. Situated on nearly 600 acres, the operation is seeing dwindling reserves on a 53-acre segment that’s been mined since the early 1960s. The newly permitted expansion will allow the quarry to tap rock sources on an additional 107 acres of land. 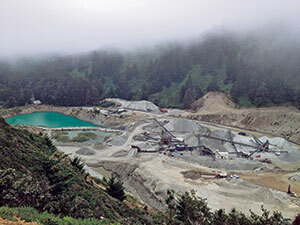 The permit was issued in early 2013 after an 11-year period of planning and presenting before entities such as the California Coastal Commission, an organization that had never before approved a quarry permit. “Getting the coastal commission to approve a permit is very much a mission impossible. However, over time we managed to convince them that it is a valuable project with a long-term, sequenced plan that will allow production for 70 or more years, and will deliver more than 52 million tons of aggregate to the region,” DeAtley says. He stresses that getting a permit in California is very difficult. “Many companies just simply give up. An operation should have plenty of money and reserves upon applying for a permit, as it’s going to take a long time. Luckily for us, we did a good enough job throughout the process that no one showed up at the final hearing to oppose us,” he says. The Pilarcitos Quarry must develop a grading, vegetation and water-management plan. To best approach the permitting process, DeAtley worked closely withBenchmark Resources, a consulting firm whose mission is “managing the uncertainties inherent to permitting and compliance.” Benchmark Project Manager Kevin Torell joined the process in 2007 and offered critical assistance in preparing the environmental impact report, and the final mining and reclamation plan. “Our biggest challenge was navigating through the layers of oversight among the county planning commission and the coastal commission, whose specific local requirements intensified what could and couldn’t be disturbed by mining,” Torell says. “We wanted to avoid any appeals to the coastal commission as this could add to time and costs, or could even kill the project. “It was critical to keep the coastal commission in the loop the whole time so that they would not have a negative reaction to the plans once they finally reached their desks,” he stresses. “It’s important for operations to work with a consultant, especially during the planning-commission stages,” Torell adds. Another strategic partnership was joining forces with one of the region’s leading players in the environmental community. “This person is an archivist with the county of all the various local coastal project plans. She helped us find the past precedents that might pave the way for our approvals. Plus, she understood the value of local aggregate availability, and realized that we were ready and willing to make any necessary adjustments to satisfy environmental needs,” DeAtley says. One of the major mitigating factors that allowed acceptance of the final plan is the creation of a conservation easement of approximately 192 acres. “We will be mitigating at a rate of three to one. For every acre we mine, we have to give back three acres to nature. We will be reclaiming as we go,” DeAtley says. “We have also created an annuity to manage the property by setting aside monies to make sure that the conservation easement is properly cared for over time. In the end, the fully reclaimed site will be that of a very large water reservoir,” he says. Another issue was the disturbance of endangered red-legged frogs. “We have to build very sophisticated frog ponds on a segment of our property,” DeAtley says. The frogs are relocated to what he often refers to as the “frog resort” or the “frog penthouse,” as the ponds must be built to exacting specifications to create the proper perennial aquatic habitat. The quarry must also develop a grading, vegetation and water-management plan for three additional habitat ponds to be created within the conservation easement. The plan also includes requirements that minimize and mitigate for the loss of garter snakes and wood rats; and provide protections for nesting raptors and migratory birds. “We managed all these projects in consultation with biologists and engineers. There are lots of people involved in this process,” Torell says. “We would not have succeeded if we hadn’t taken a very conscious and over-the-top environmental approach to the conservation easement and to all the other initiatives,” DeAtley says. “We presented to anyone who would listen to us – any county supervisor, planning commissioner or community member. As we are one of only three quarries in the area, our goal was to educate them about mining and the importance of local sources of aggregate,” Torell says. Without the new permit, the county would lose a major source of aggregate and would have to import it all. 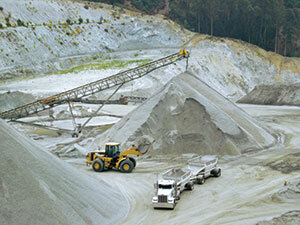 Truck loading at West Coast Aggregates’ Pilarcitos Quarry in coastal California. Torell prepared and shared an impact report regarding the latter, which included increased truck traffic and the effects of greenhouse gases and emissions, as well as the losses of jobs, industry and market revenues. “We started early in building a backing in the community by our immediate responses to any questions or concerns,” he says. Both DeAtley and Torell agree that the biggest mistake that most operations make in the permitting process is not having enough transparency. “Some operations think they need to be somewhat secretive and that one doesn’t need to inform everyone of everything – and to a certain extent that may be true. However, when people don’t understand the mining industry, their first reaction may be negative. Get them involved from the get-go. It is harder to get through to them after they have already put up their guard against a project,” Torell says. “People need to understand the importance of what we provide,” says DeAtley. Pilarcitos Quarry has been opening its doors for more than a decade at its annual Quarry Day. The idea, he explains, is developing a “feeling of community” by showing our neighbors, families and friends exactly what we do. The biggest mistake that most operations make in the permitting process is not having enough transparency. Carol Wasson is a veteran freelance writer for the aggregates and construction equipment industries.